Think Slim! Business notebooks are usually conservative and rather bulky working devices. 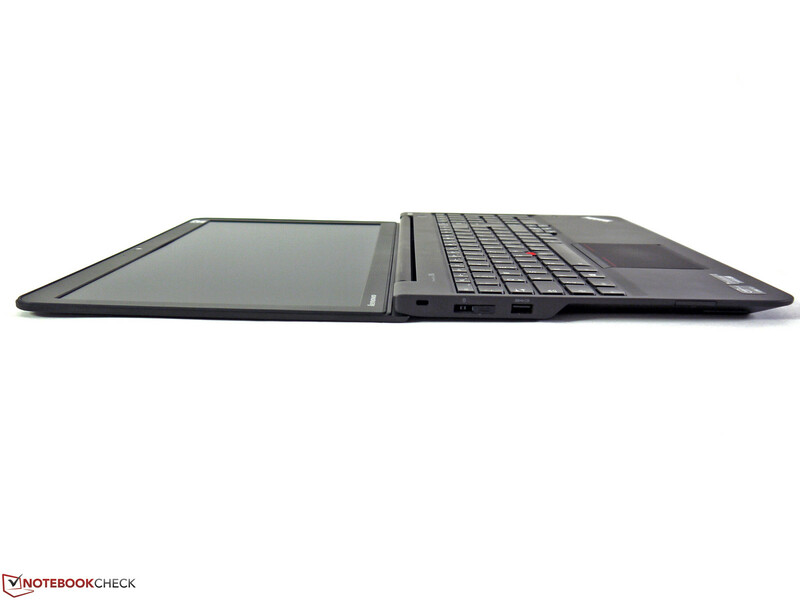 Lenovo’s ThinkPad S531 is one alternative that wants to eliminate this prejudice. 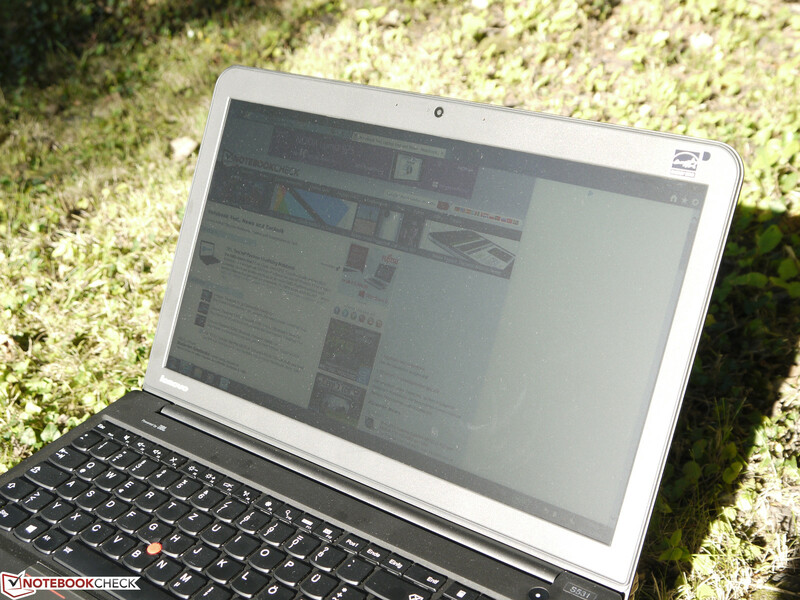 It combines typical business features with a slim ultrabook design. We checked if the attractive specifications are convincing. 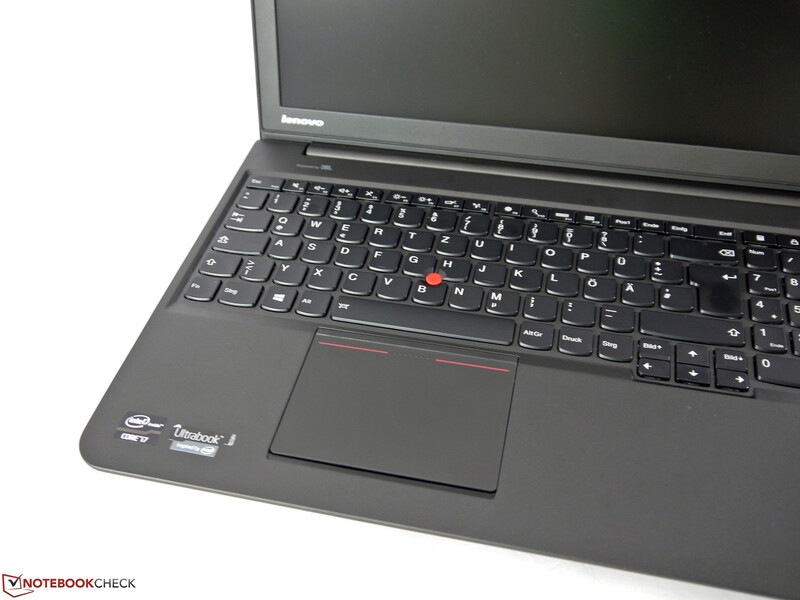 The Lenovo ThinkPad S531 is a device from Lenovo’s new S-series; the devices represent business notebooks with ultrabook designs and share many similarities with the ThinkPad Edge-series. 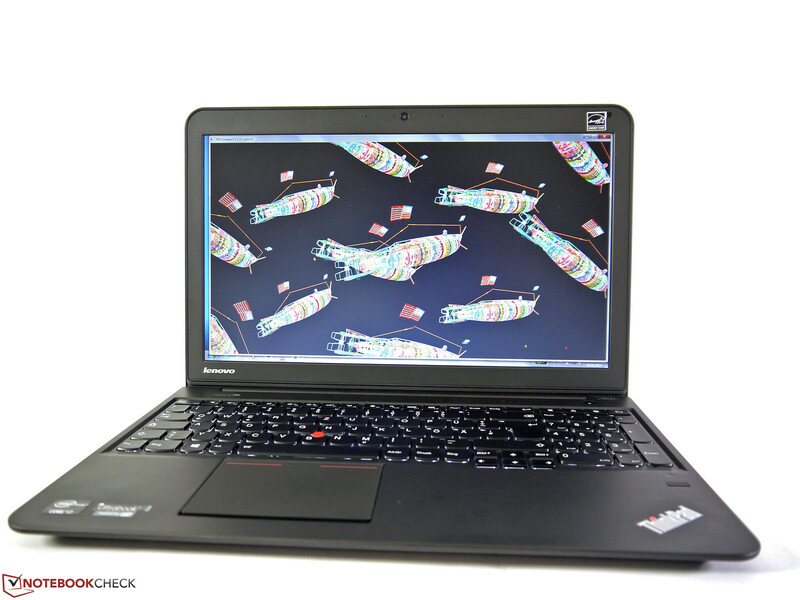 The ThinkPad S531 is an intermediate step until the arrival of the S540 and is still based on Intel’s Ivy Bridge architecture. 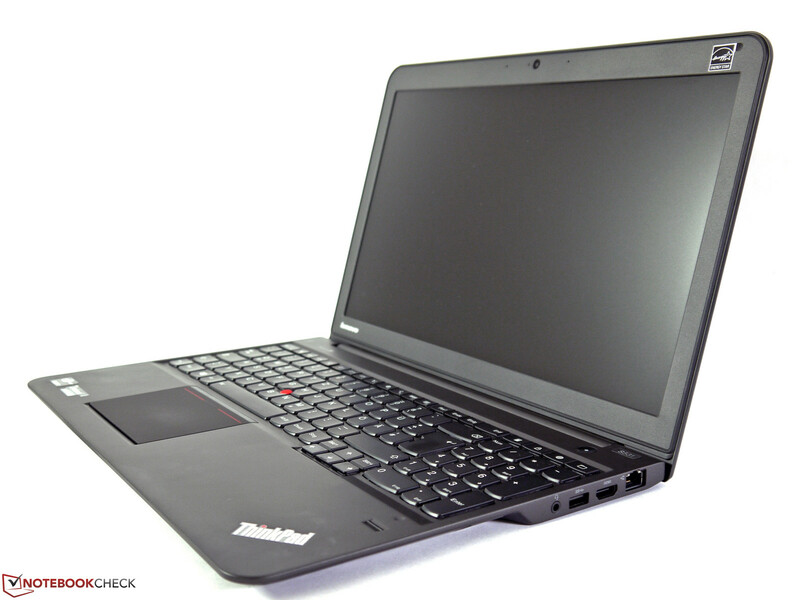 According to Lenovo, the ThinkPad S540 with Haswell processors will be available in October. 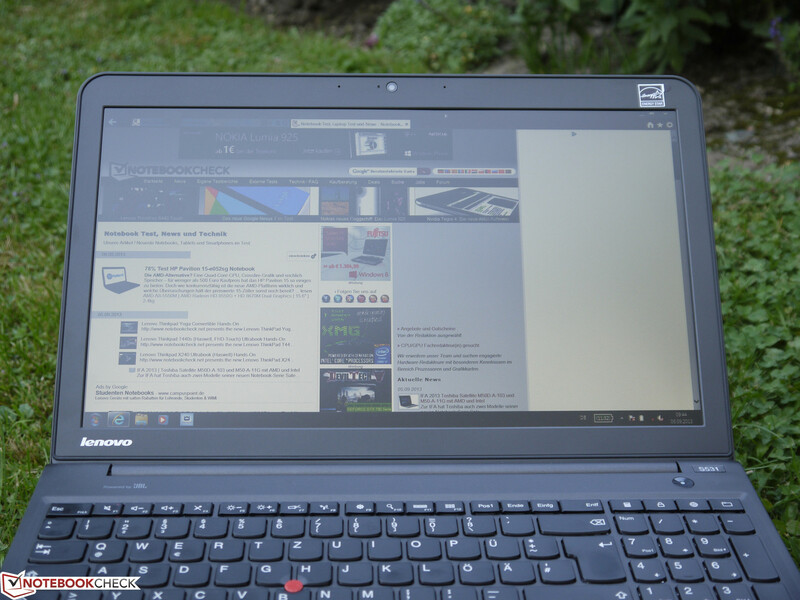 We already reviewed one member of this new generation a couple of weeks ago, the Lenovo ThinkPad S440. It was certainly not one of the fastest business notebooks with its energy-saving features, but offered a good balance between mobility and performance in return. 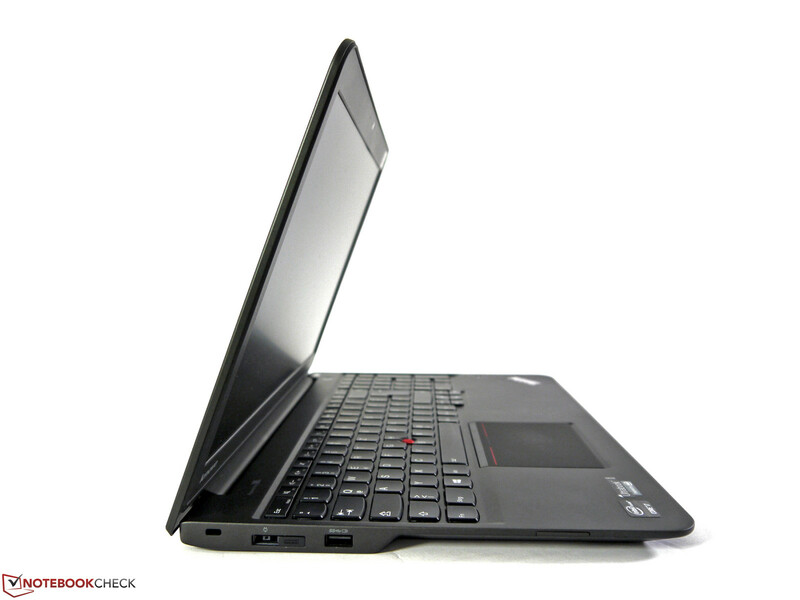 Currently there are four different configurations of the ThinkPad S531 available. The street prices start at around 700 Euros (~$934) all the way up to 1,100 Euros (~$1468) for our review configuration. 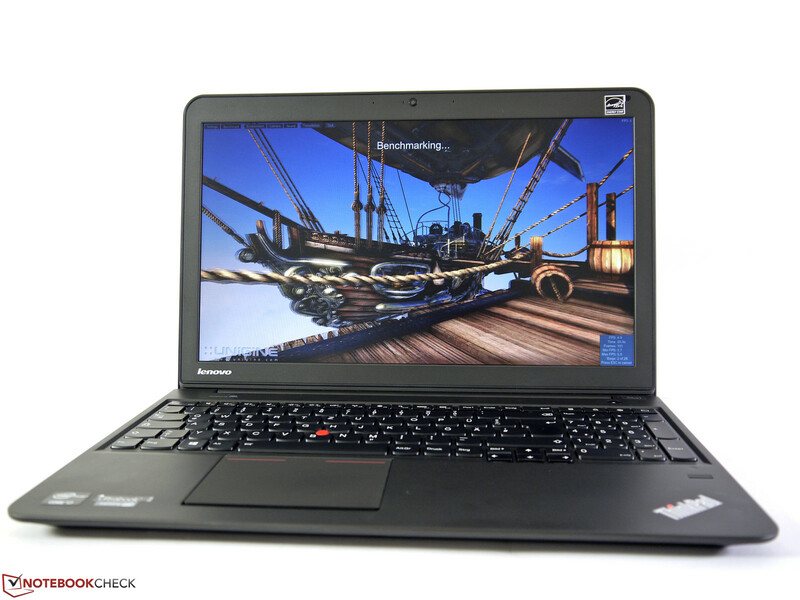 At the time of this review, you cannot configure the ThinkPad S531 in Lenovo’s online store. Our review unit is equipped with an Intel Core i7-3537U CPU (Ivy Bridge), the dedicated AMD Radeon HD 8670M graphics, 10 GB RAM, a 256 GB Solid State Drive and a Full HD display. 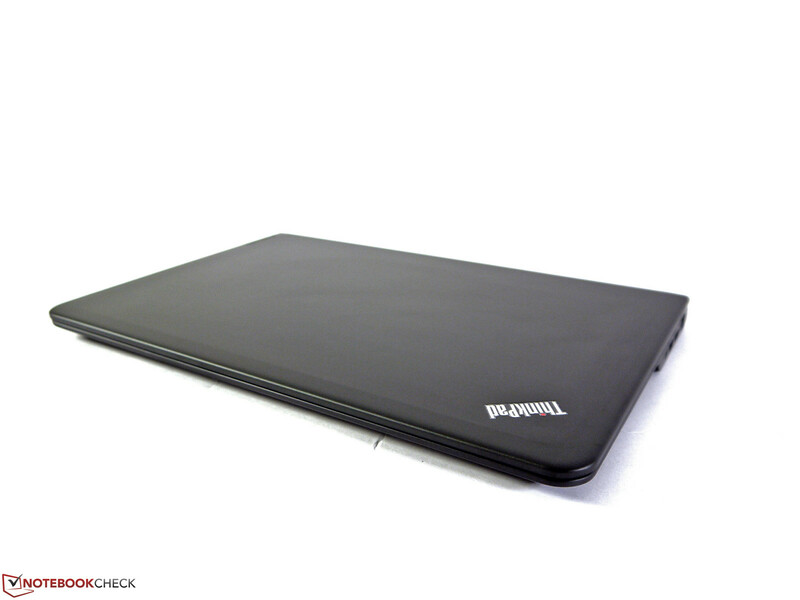 The dark gray case and the straight design provide the typical ThinkPad look. There are no chrome elements, curlicues or glossy surfaces. The necessary understated look for business scenarios is maintained and meets the requirements of many professional users. The surfaces of the base unit are very cool and enable a reserved yet nice design. The overall stability of the case, which is made of aluminum and a magnesium alloy, leaves a very good impression. It is nice to see that Lenovo manages to combine the sturdiness with a low weight of 2,050 grams (~4.5 pounds), which is actually very close to the Apple’s MacBook Pro 15 Retina, although the MacBook is equipped with much faster hardware. The palm rest is very firm, you cannot twist the case and the bottom cover cannot be dented. The display hinge is also very firm and keeps the display well in position. The display cover can hardly be twisted; many competitors have more problems in this regard. We cannot determine any impacts on the picture or the stability. 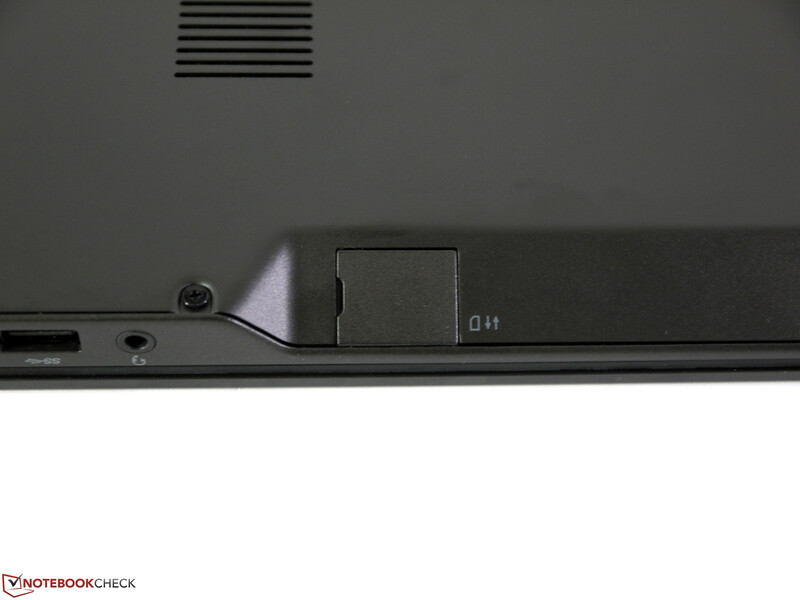 Similar to other modern ThinkPads, features like the double-latch mechanism or Clamshell design are gone. The S531 has a low weight of 2,050 grams. 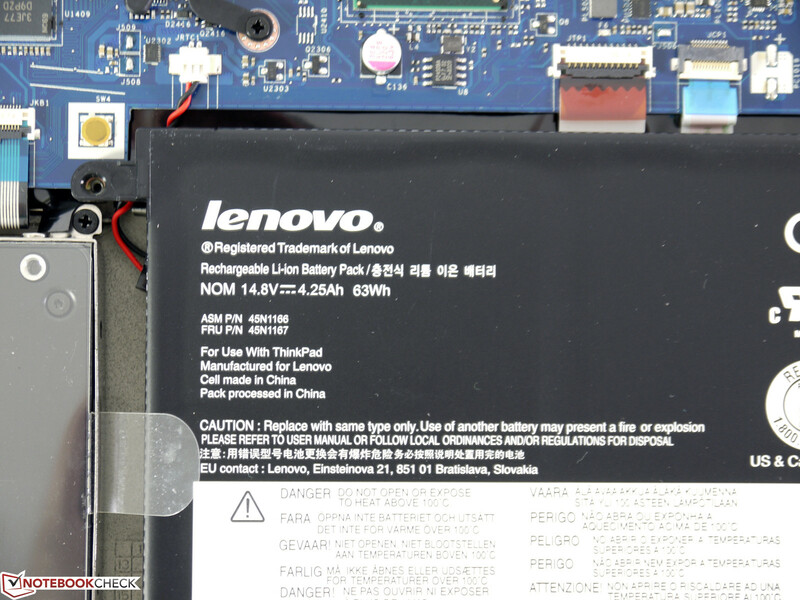 The port equipment is almost identical compared to the Lenovo ThinkPad S440. 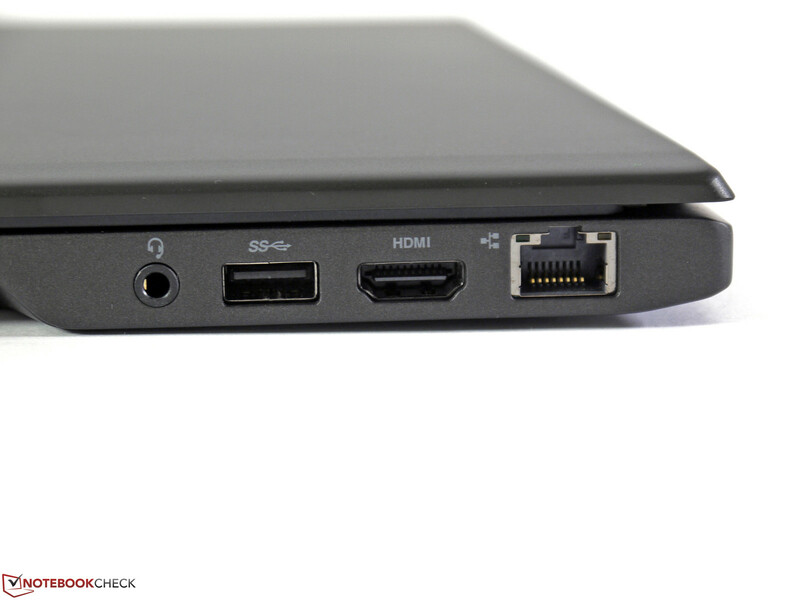 2x USB 3.0, HDMI, card reader, Gigabit LAN and stereo jacks are the most common ports. 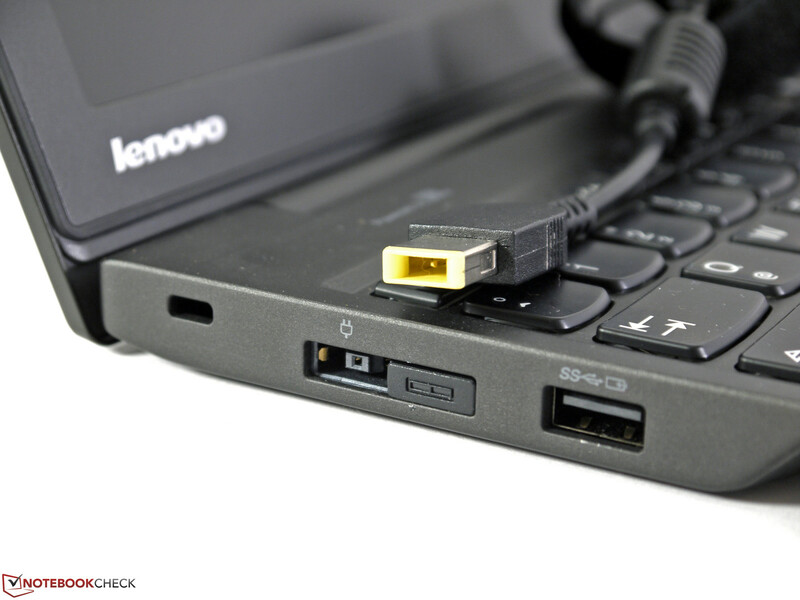 Lenovo’s OneLink docking solution is a big advantage over many ultrabook competitors. You can easily attach peripherals and other cables when you use your notebook on the desk, for example with Lenovo’s OneLink Dock (4X10A06083 around 100 Euros/~$133). The OneLink solutions also include the power supply, so you will not need an additional power cord. 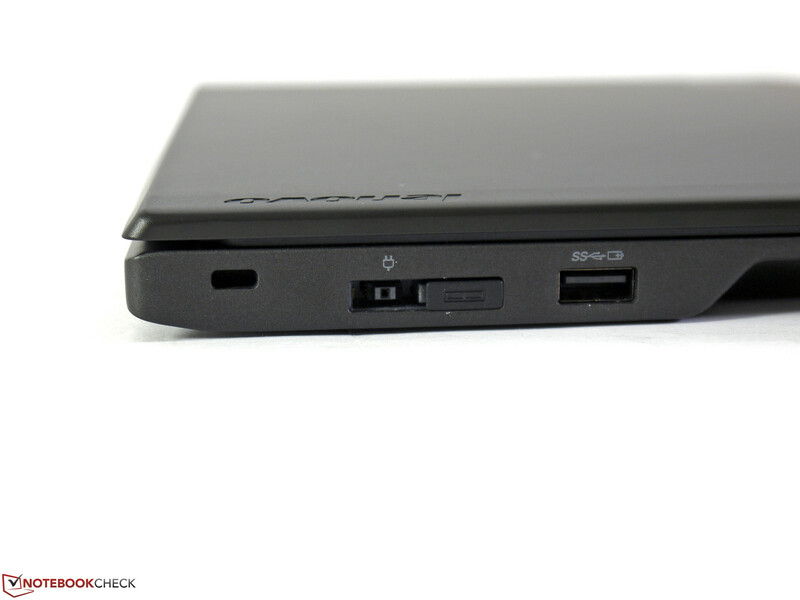 Most of the ports are located at the rear of both sides of the case. Attached cables are therefore not occupying any important space on the desk. Only the card reader is further at the front, which does improve the accessibility. 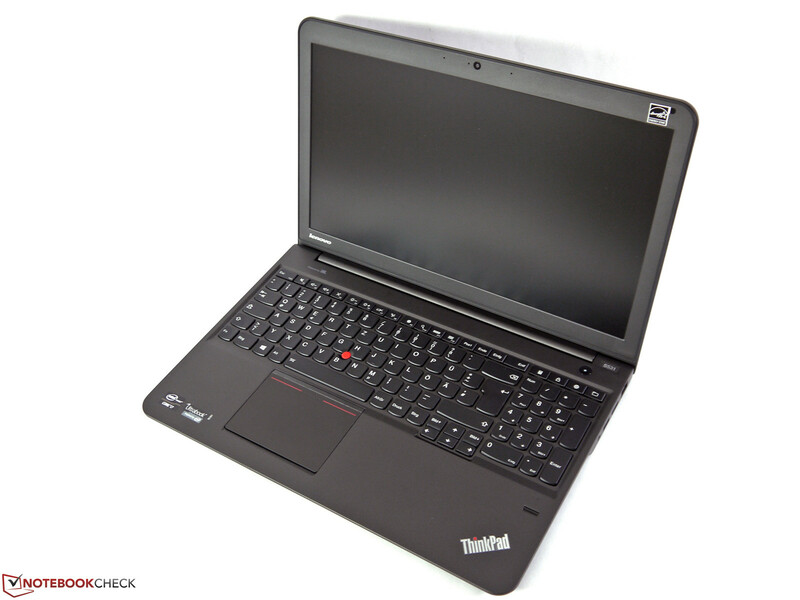 Contrary to the Lenovo ThinkPad S440, our ThinkPad S531 is equipped with a WLAN module from Broadcom. The Broadcom BCM43228 has two antennas, does support the 802.11n standard and is on the same level as the Atheros AR9485WB-EG (Asus N76VZ) in terms of performance. 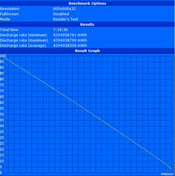 Using the rough Window’s signal bar performance comparison, Intel’s Wireless-N 7260 from the ThinkPad S440, with one signal bar more at a distance of 10 meters (~33 feet), was slightly better. We also checked the WLAN performance of both ThinkPads with an 802.11n router (Ralink RT2860T) and a distance of 2 meters, 5 meters and 10 meters (~6.6, 16.4 & 32.8 feet) in direct sight. We determined a performance advantage of 1-2 MB/s for the Intel Wireless-N 7260 for all distances; the Broadcom module cannot keep up with the Intel solution in the ThinkPad S440. Another difference compared to the smaller 14-inch sibling can be found at the left side of the case. Here is a small cover for the SIM card tray. 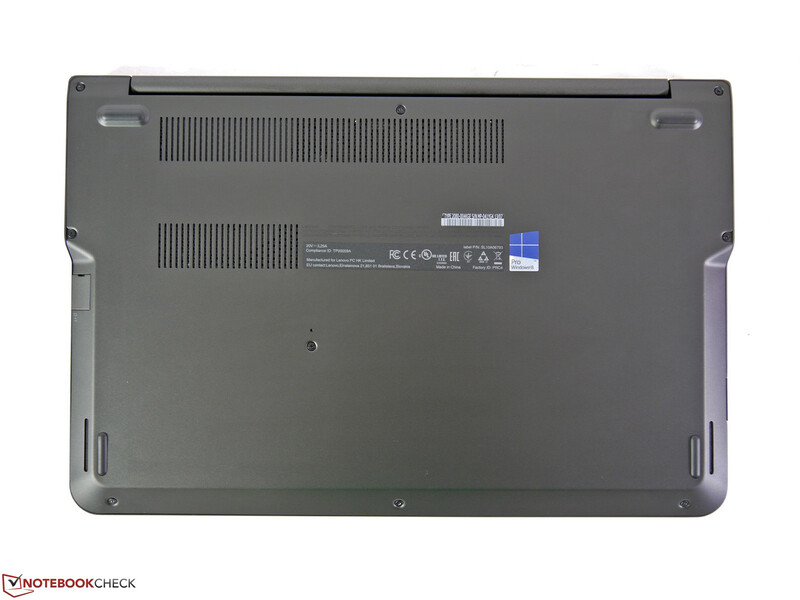 Our review unit has neither a WWAN modem nor the associated antennas, but maybe it is an indicator that the following ThinkPad S540 or even other ThinkPad S531 configurations will be equipped with a UMTS module. Other features such as Bluetooth 4.0 and a webcam (720p) are pretty much standard nowadays and the S531 is no exception. 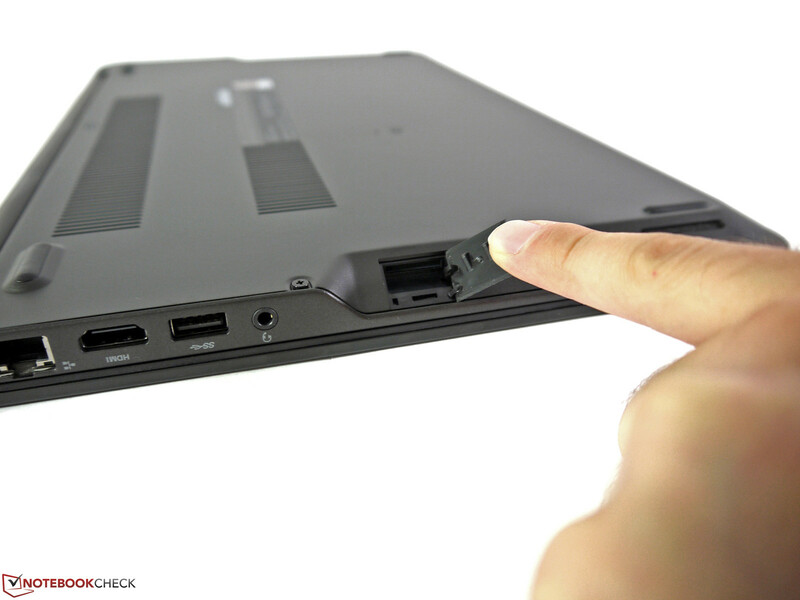 The ThinkPad S531 has a fingerprint reader, Lenovo’s Airbag hard drive protection, Intel’s Anti-Theft and Computrace support. The latter are already activated in the BIOS (F1). You can also set different BIOS and device passwords in addition to protect your data against unauthorized access. However, there is no smart card reader or facial recognition software. 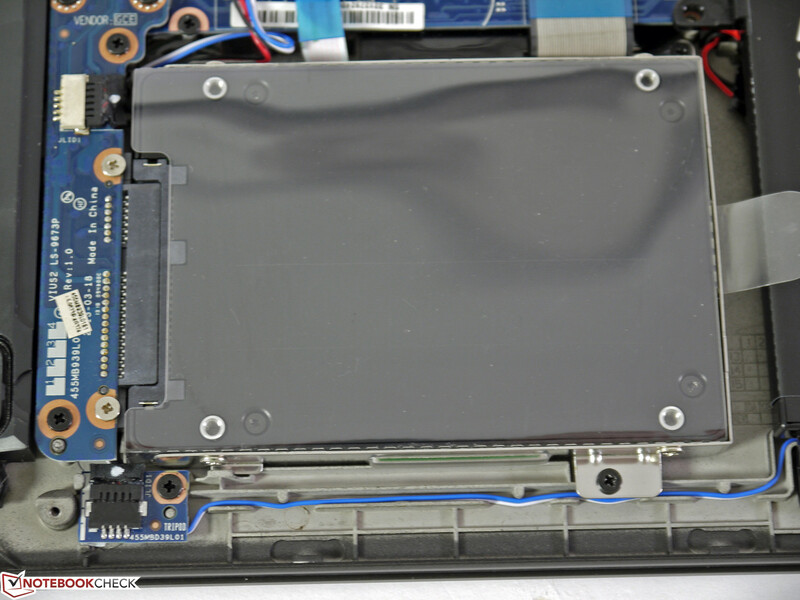 The bottom cover can easily be unscrewed and removed and reveals all the important components. You can clean the fan and access the several slots. Our review unit already has the maximum system memory, 2 GB PC3-12800 RAM are soldered onto the mainboard and there is one memory slot with an 8 GB module. 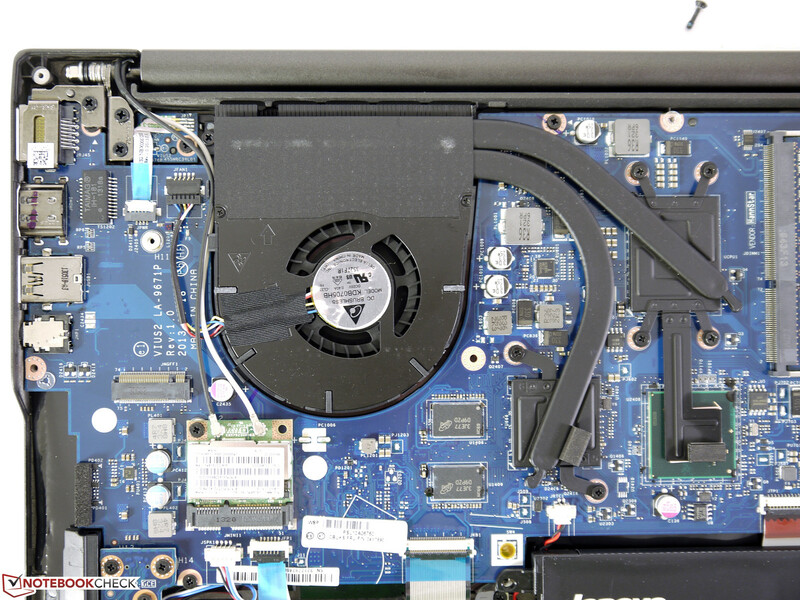 There is also one empty M.2 slot that can be equipped with an appropriate Solid State Drive. 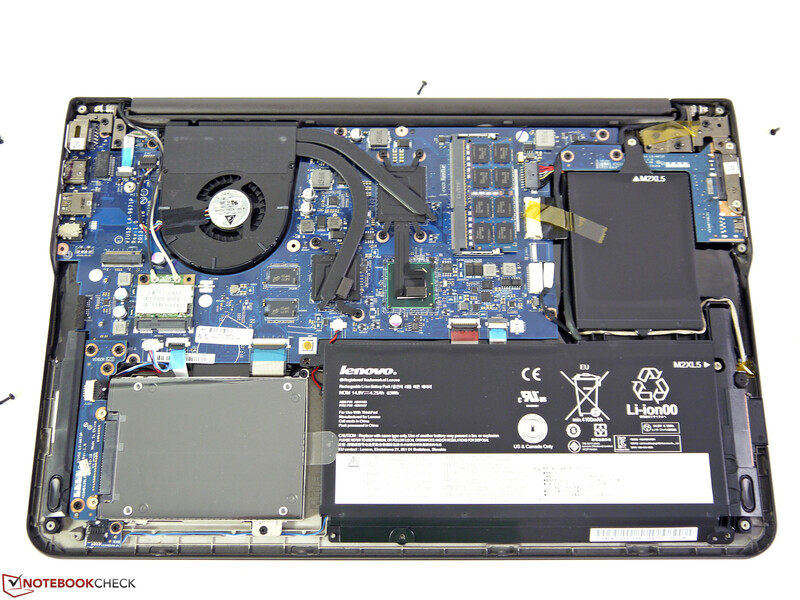 The warranty period of the ThinkPad S531 is 12 months. 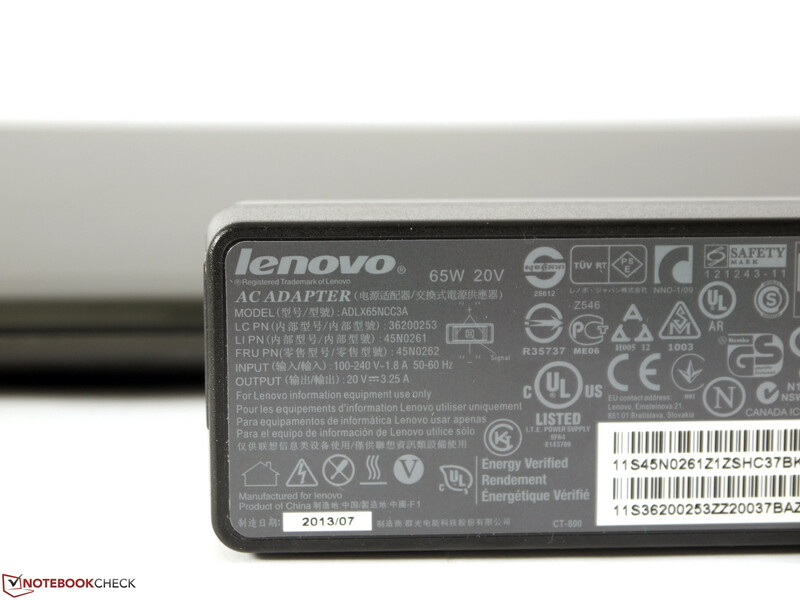 As usual with Lenovo, you can extend that warranty period or the service type for an additional charge. An upgrade to 24 months of On-Site service (Lenovo ThinkPlus ePack (78Y1521)), for instance, is available for around 60 Euros (~$80). 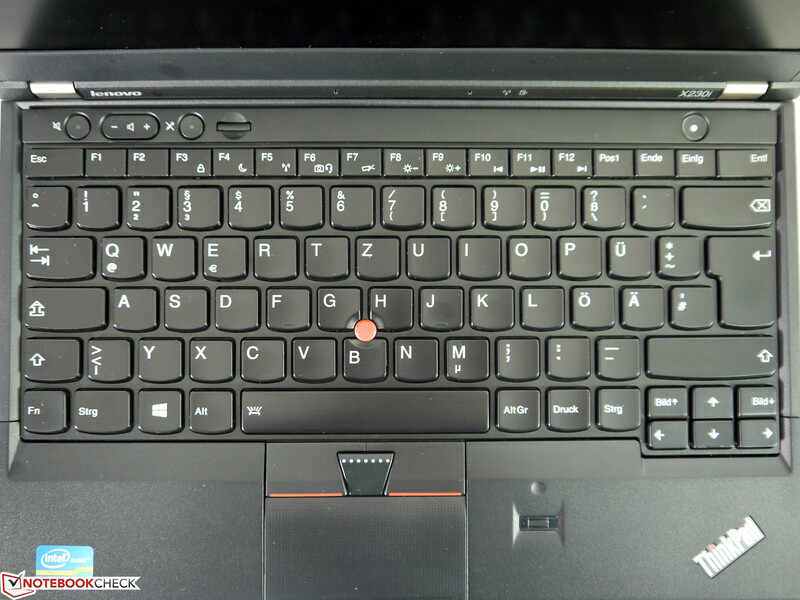 Lenovo’s Chiclet-style keyboard has conveniently sized keys of 19 mm. 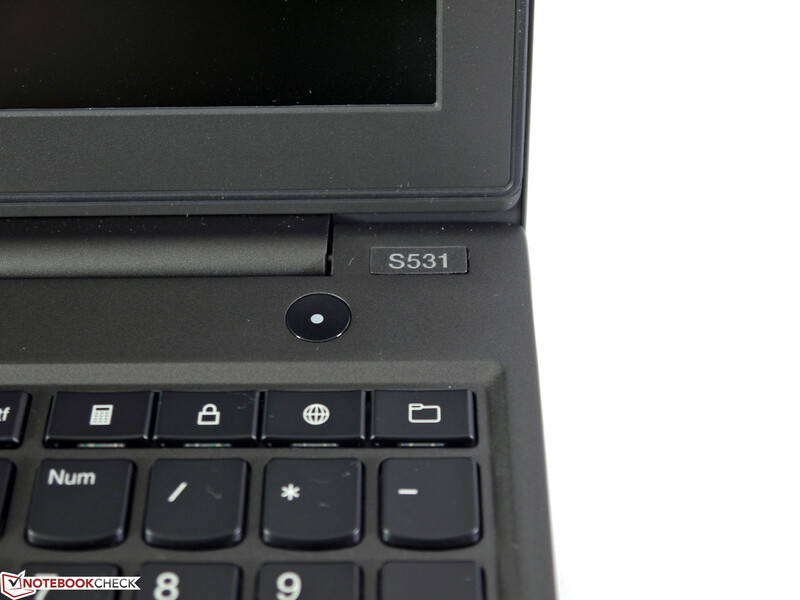 Contrary to the Lenovo ThinkPad S440, the larger S531 is also equipped with a separate numeric keypad, which especially improves the input of long numbers. The background illumination is also very comfortable and is very convenient in darker environments. The keys have an average travel, a well-defined pressure point and a very low noise development. 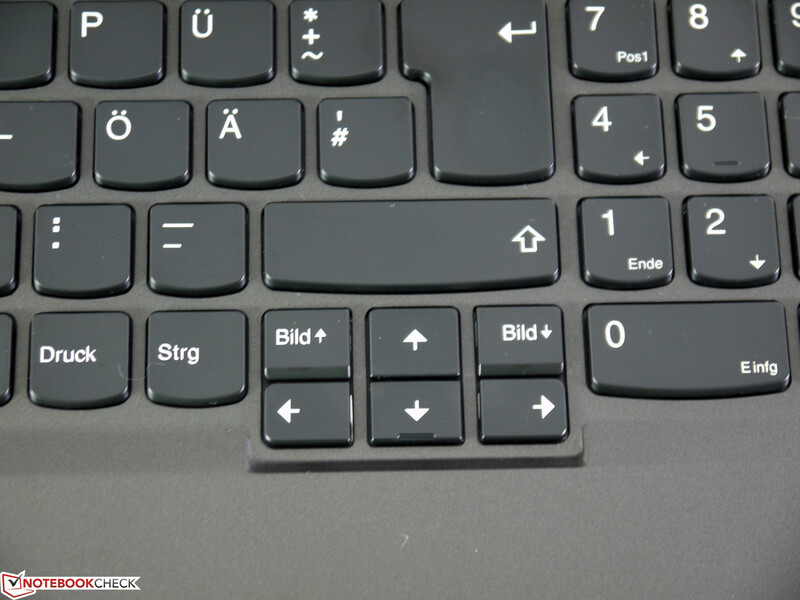 The keyboard itself is very firm, we could not dent it anywhere, and we could not determine any clatter or other problems either. 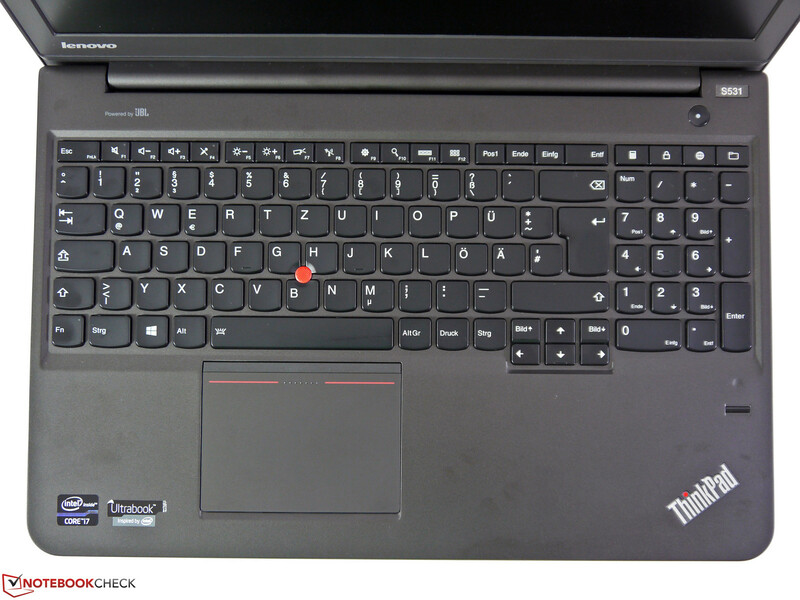 Since the layout of ThinkPad keyboards is slightly different, it will take some time getting used to for beginners: Ctrl and Fn, for instance, are switched and the Print button is in the lower area. 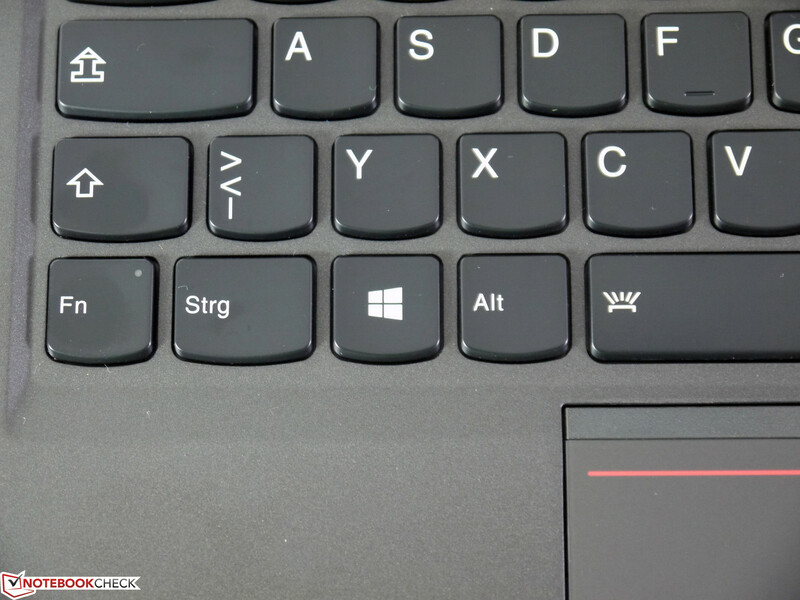 The small vertical arrow keys are also unusual and could have been bigger in our opinion. 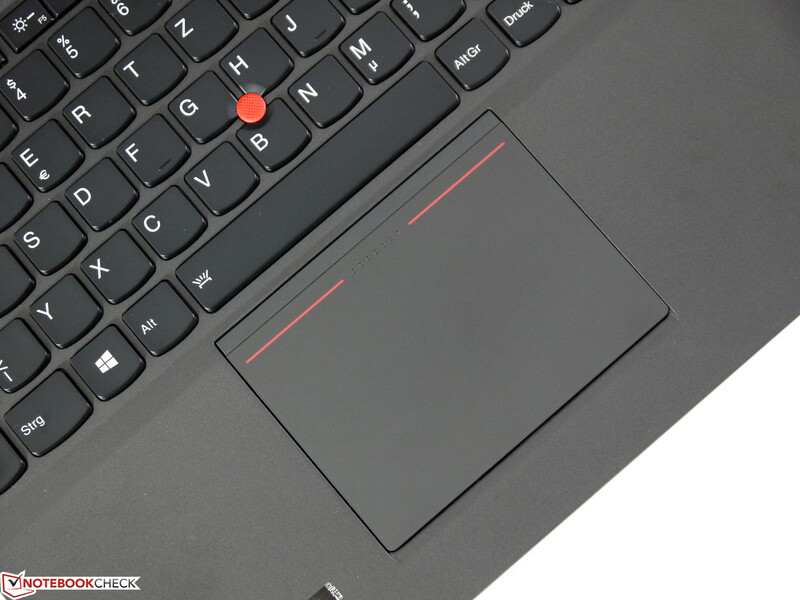 The touchpad with 100 x 75 millimeters (~3.9 x 3.0 inches) is identical to the ThinkPad S440. It has excellent gliding capabilities, is very accurate and supports multi-touch and Windows 8 gestures. 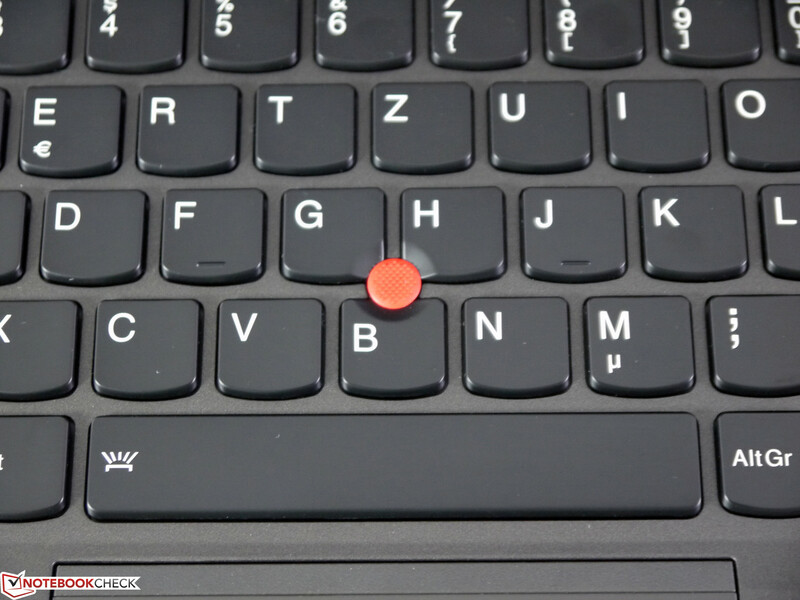 You can click the whole touchpad and it integrates the TrackPoint buttons and mouse buttons, which were usually separate in old ThinkPads. 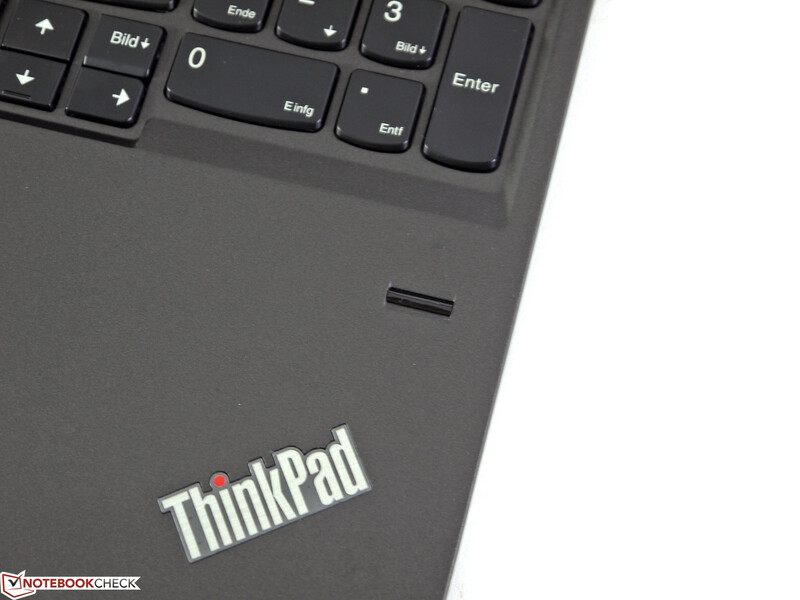 Similar to the ThinkPad S440, we do not really like this new solution, especially in combination with the very precise TrackPoint. Inputs are often not recognized because you need more force and more precision compared to the excellent solution of the predecessors. 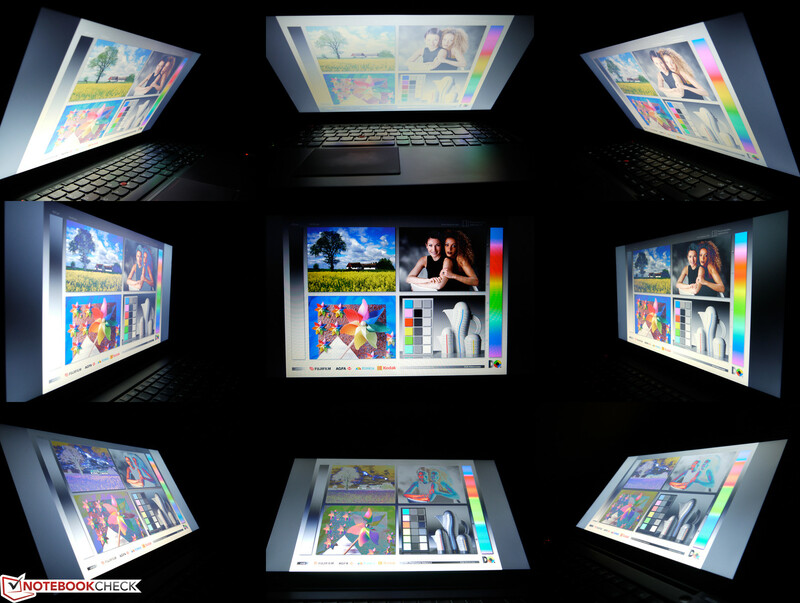 Most configurations of the Lenovo ThinkPad S531 are currently equipped with a matte HD display and a resolution of 1366x768 pixels. Our review unit on the other hand uses a Full HD panel with a resolution of 1920x1080 pixels. The result is more space on the desktop and a higher pixel density of 141 ppi instead of 100 ppi. 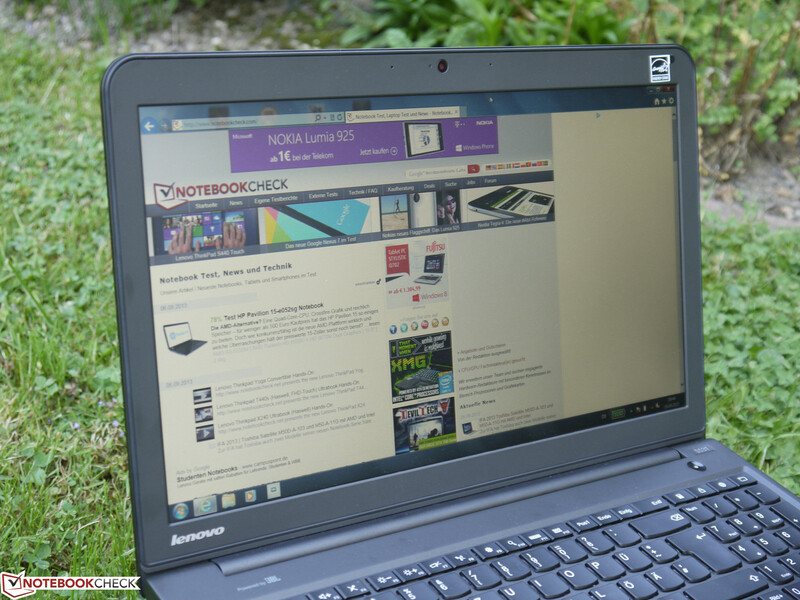 Lenovo promises a brightness of 300 cd/m² for the Full HD display. Similar to the ThinkPad S440, this value once again cannot be reached. We only measured 275 cd/m² at the brightest spot; the average result is just 259 cd/m². This is significantly brighter than the smaller 14-inch sibling, but still below the advertised value. 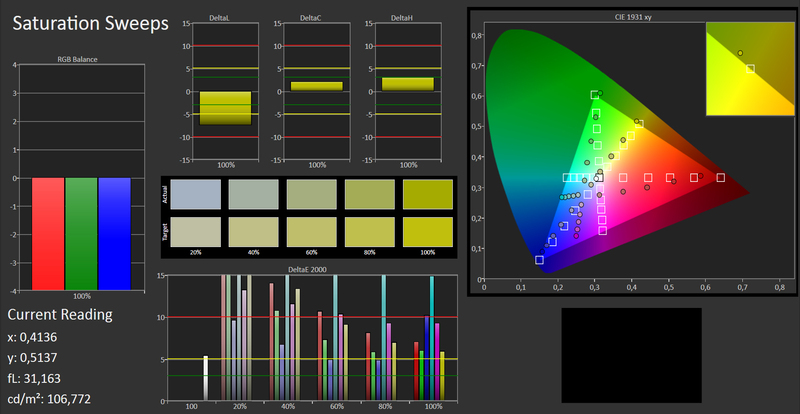 The brightness distribution is 86% but you can only see differences with plain backgrounds. The background illumination can be adjusted in 15 steps: Step 1 is very dark with 8 cd/m², step 13 is sufficient indoors with 139 cd/m² and step 15 is the already mentioned maximum brightness. 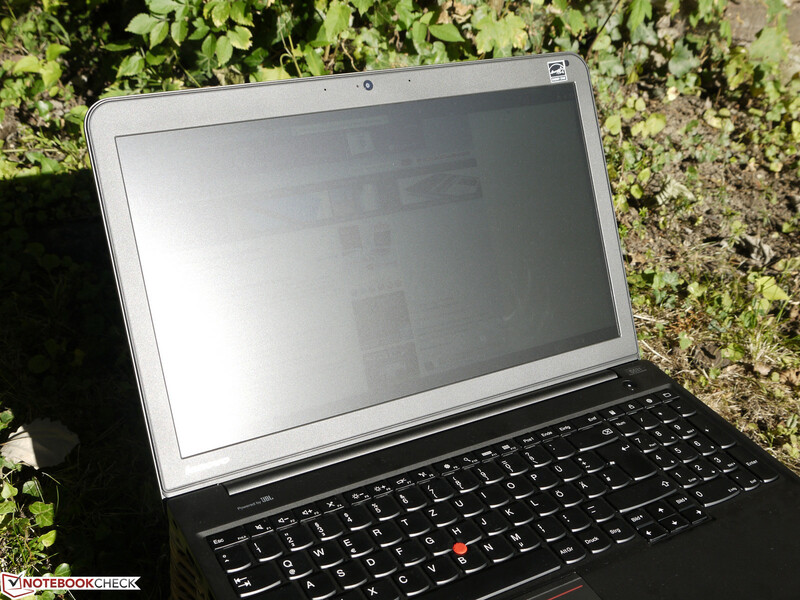 The ThinkPad S531 is well suited for outdoor use thanks to the matte surface of the Full HD display. It does not matter if you are in the shade or with sunlight from the sides, you can always see the display content. Longer working sessions are therefore no problem and only require small adjustments of the display position. Direct sunlight however reduces the visibility noticeably and you cannot really use the device anymore. The display brightness is fortunately not reduced on battery power. 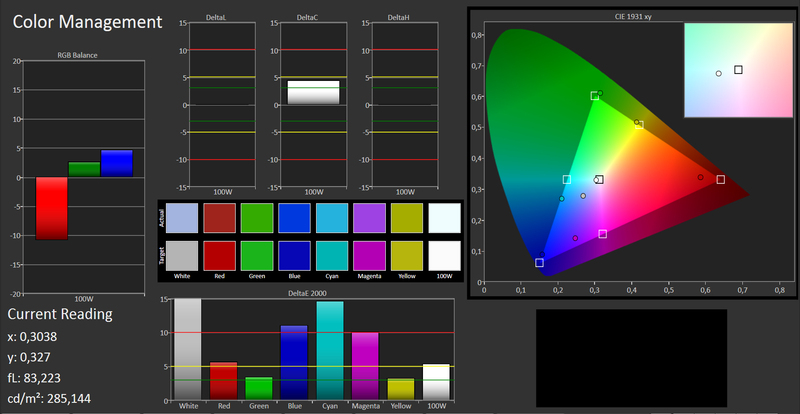 However, the display is not ideal for high-contrast picture or video editing. 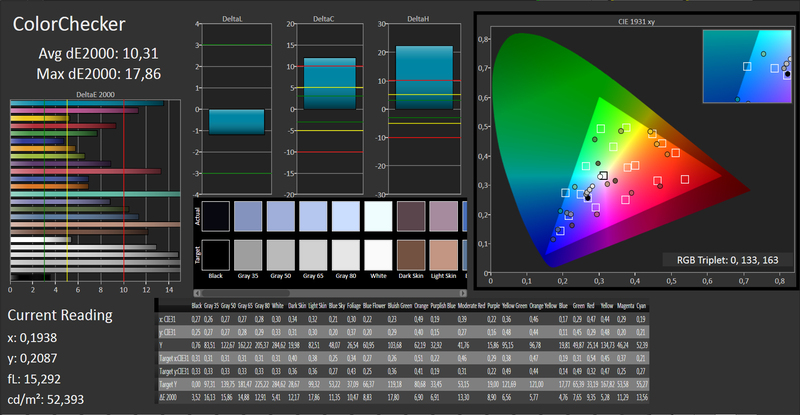 We only measured a contrast ratio of 293:1, which is significantly lower than our long-time average result of 400:1. Colors are a bit pale and deep blacks are replaced by dark gray. 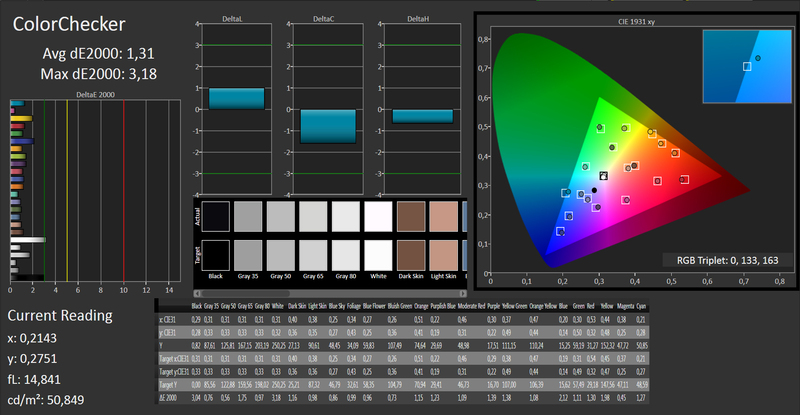 The coverage of the sRGB color space is 80%. The display is not really optimized for the best presentation out of the box. 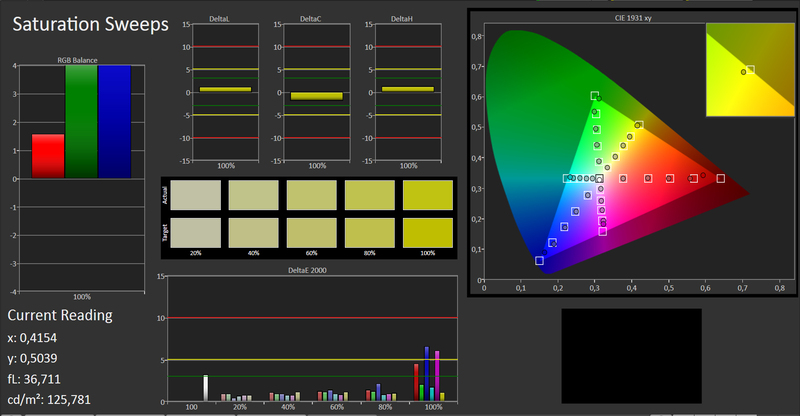 Grayscale presentation, color accuracy and saturation deviate from the ideal values. The average DeltaE (2000) value above 10 confirms our initial impressions. 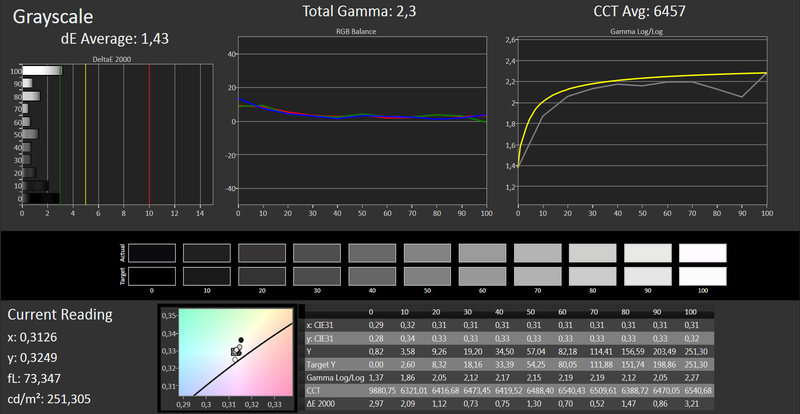 The situation changes after the calibration and we can improve the values. 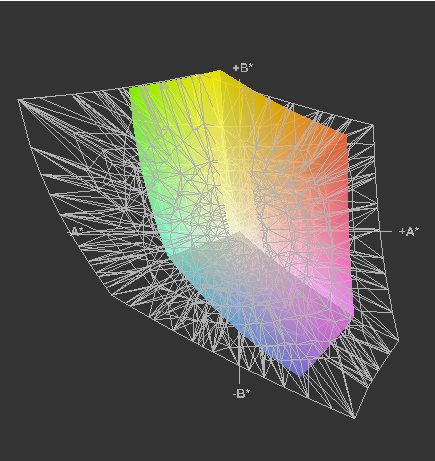 Both the color accuracy and grayscale presentation reach excellent (at least for notebooks) DeltaE (2000) values of 3.18; deviations are not visible to the human eye anymore. The only small drawback is the saturation. The viewing angle stability meets our expectations for a TN panel. Even small vertical changes result in a reduced contrast ratio and colors start to invert. We can also see a slight blue or yellow cast depending on the orientation. The situation is significantly better with horizontal viewing angles, where we can only see slight brightness and color differences. 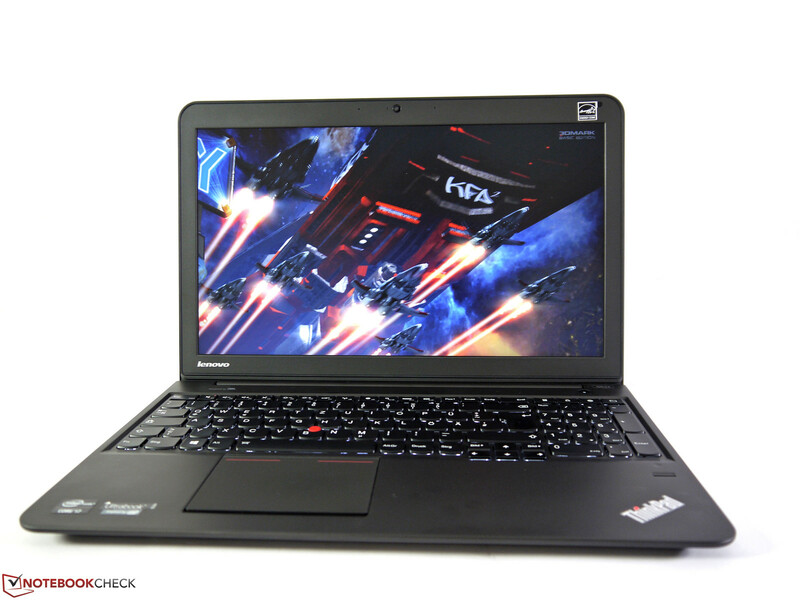 There are currently three different processors for the Lenovo ThinkPad S531 (Intel Core i3-3227U, Intel Core i5-3337U or Intel Core i7-3537U), with and without AMD Radeon HD 8670M graphics, 4 up to 10 GB RAM and several storage solutions. Prices are between 700 Euros and 1,100 Euros (~$934 and $1468), but only configurations with Core i7 CPUs are also equipped with Full HD displays. Our review unit is still equipped with an Intel Intel Core i7-3537U Ultra-Low-Voltage CPU based on the Ivy Bridge architecture; the Thermal Design Power is 17 Watts without the chipset. 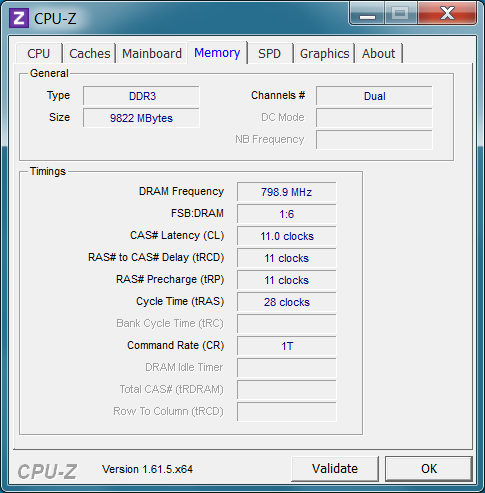 The nominal clock of this CPU is 2 GHZ, which can be raised up to 3.1 GHz for single threaded applications via Turbo Boost. 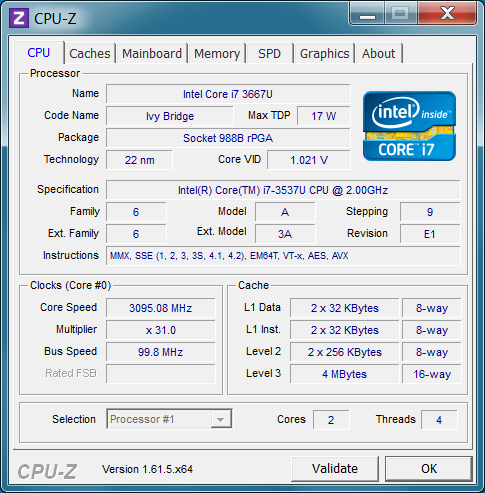 The dual-core CPU supports Hyperthreading and can execute up to four threads simultaneously. Compared to standard voltage CPUs with a TDP of 35 Watts, the frugal i7 is similar to an Intel Core i5-2540M CPU in terms of performance. Our review unit gets 5,268 points in Cinebench R10 64-bit (single) and 11,391 points (multi). Our practical tests with iTunes MP3 conversion (45.1x speed) and video conversion are sometimes slower and sometimes faster than the latest Haswell competitors Intel Core i7-4500U and Intel Core i5-4200U. We could not determine any performance limitations on battery power; the CPU clock does not drop below the nominal clock even under continuous load. The overall system configuration is well balanced and there are no unnecessary bottlenecks. We get dual channel memory, a fast Solid State Drive and the processor has sufficient performance for many tasks. Similar to the ThinkPad S440, the performance advantage of the dedicated AMD Radeon HD 8670M over the integrated Intel solution is disappointing, even the advantage in complex 3D applications is sobering and there are not many cases where you can really feel the difference. The system benchmark results are slightly below the ThinkPad S440, which is already based on the new Haswell architecture; we got 12,583 points in PCMark Vantage and 3,681 points in PCMark 11. 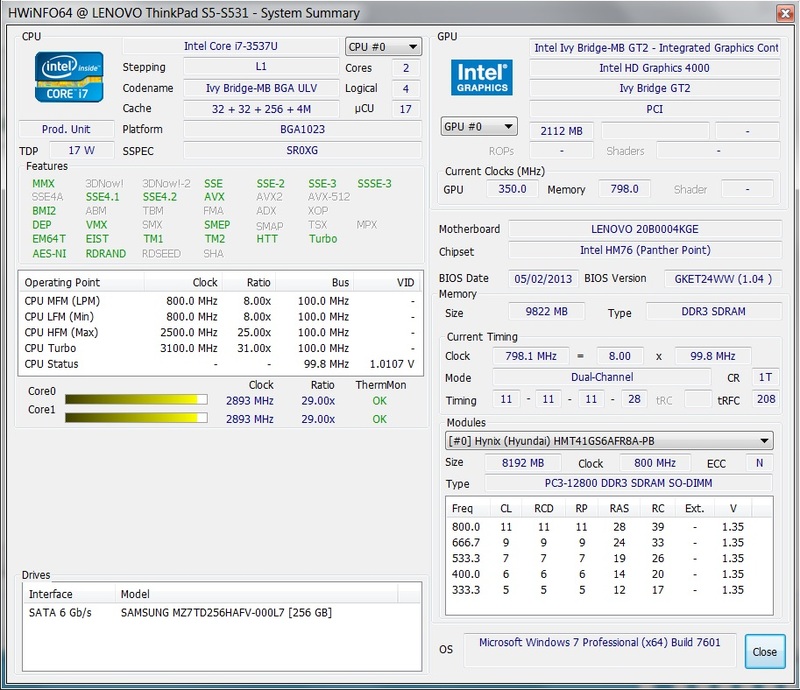 We could not switch to the dedicated AMD GPU for these benchmarks and had to use the integrated Intel HD Graphics 4000. This is also the reason for the comparatively low scores. Our review unit is equipped with a 250 GB (gross) Solid State Drive and offers a lot of fast memory. The 2.5-inch Samsung SSD 840 (7 mm height) provides transfer speeds of up to 500 MB/s (reading) and 238 MB/s (writing). In combination with the low access times of around 0.1 ms, the flash storage enables a very convenient and fast user experience. There is also an additional empty M.2 slot for another SSD. Less expensive configurations are equipped with a conventional hard drive with an SSD cache module in the M.2 slot. 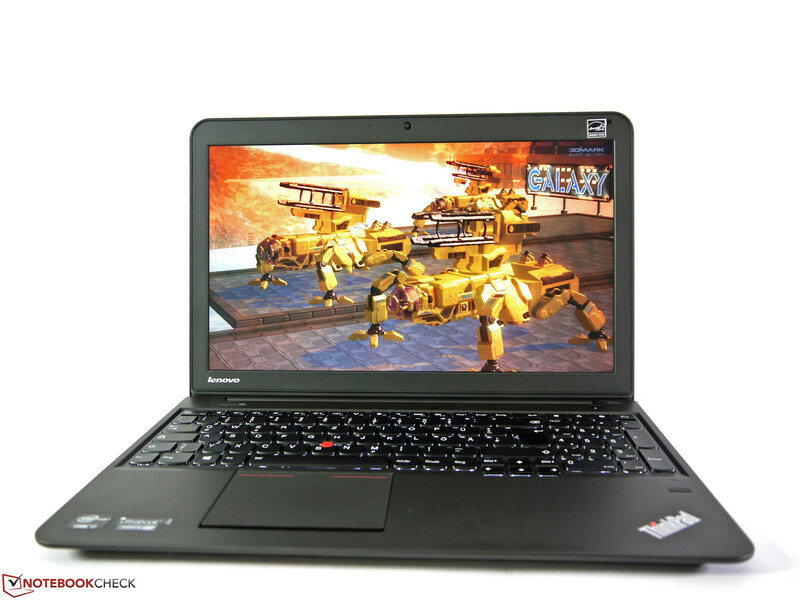 The ThinkPad S531 can either use the integrated Intel HD Graphics 4000 or the dedicated AMD HD 8670M. AMD’s switchable graphics is similar to Nvidia’s Optimus technology and offers an automatic or manual selection to assign the GPU to specific applications. Unfortunately, not every application in our benchmark suite worked with the AMD graphics, for example, Cyberlink’s Media Espresso or the already mentioned PCMarks. Otherwise the results of the Radeon HD 8670M are usually at the level of the ThinkPad S440 configuration; we get 4,670 points for 3DMark 06 and 1,195 points for 3DMark 11. 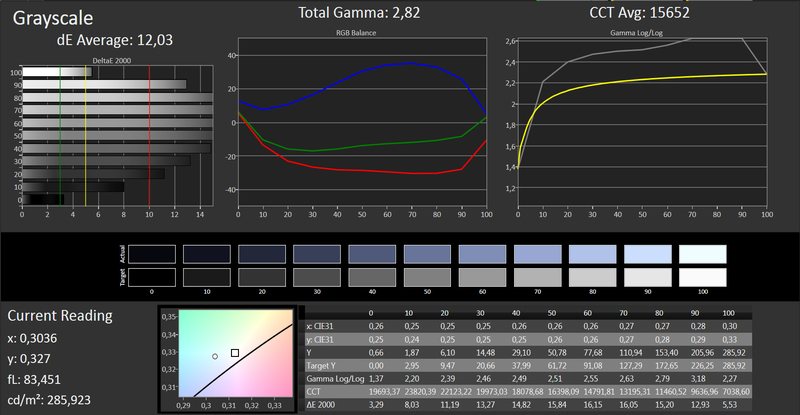 However, the good Cinebench R10 OpenGL Shading result of 6,586 points instead of 6,010 points is surprising. 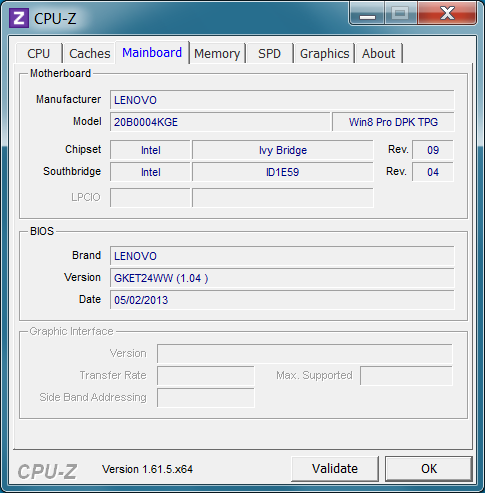 One reason could be the different operating system and the slightly older GPU driver. 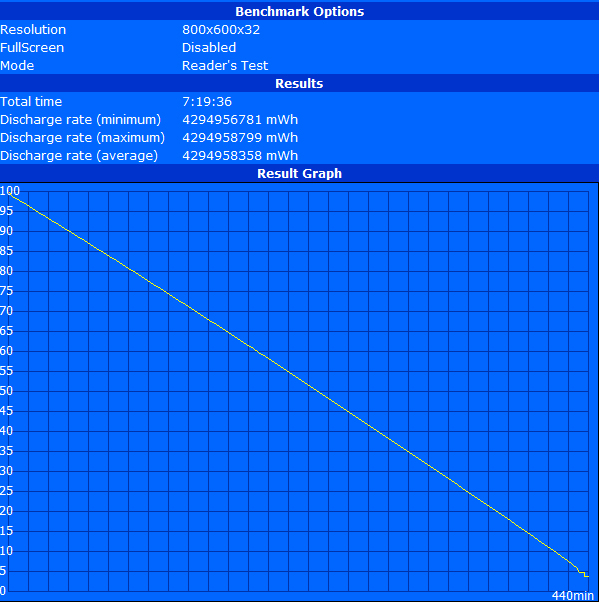 You can really see a performance advantage if you can use the GPU for complex calculations. Depending on the GPU, there are different technologies like OpenCL, CUDA, AMD APP or Intel Quick Sync. Cyberlink Media Espresso, for instance, supports Intel’s Quick Sync for video conversions. 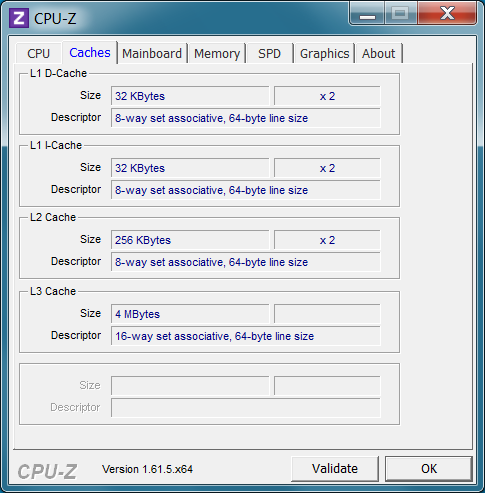 You can see the performance advantages in combination with reduced CPU load in the section Processor. 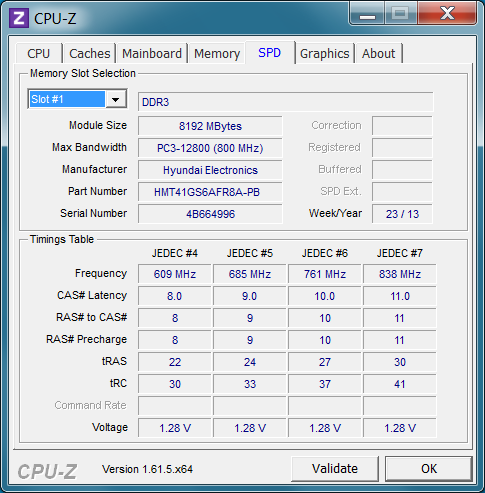 We could not use the AMD Radeon HD 8670M for Media Espresso 6.7. 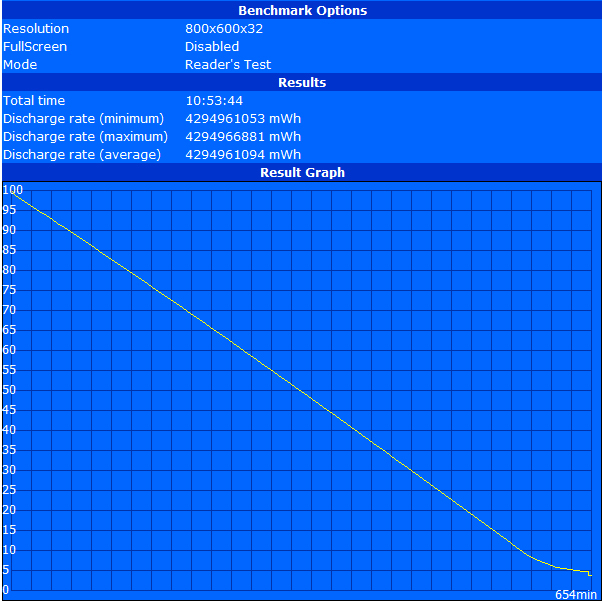 There are no GPU performance restrictions on battery power or under maximum load. Better CAD performance than expected. The 3D performance in some professional applications is actually not as bad as you might think. Compared to alleged fast consumer chips like the Nvidia GeForce GT750M (in this case SLI) or the GeForce GT 740M, the Radeon HD 8670M is actually similar or even faster. However, it cannot compete with entry-level Quadros or FirePros. We could play all titles at least with minimum or in most cases even medium details, except for very demanding games like Metro Last Light or Alan Wake. 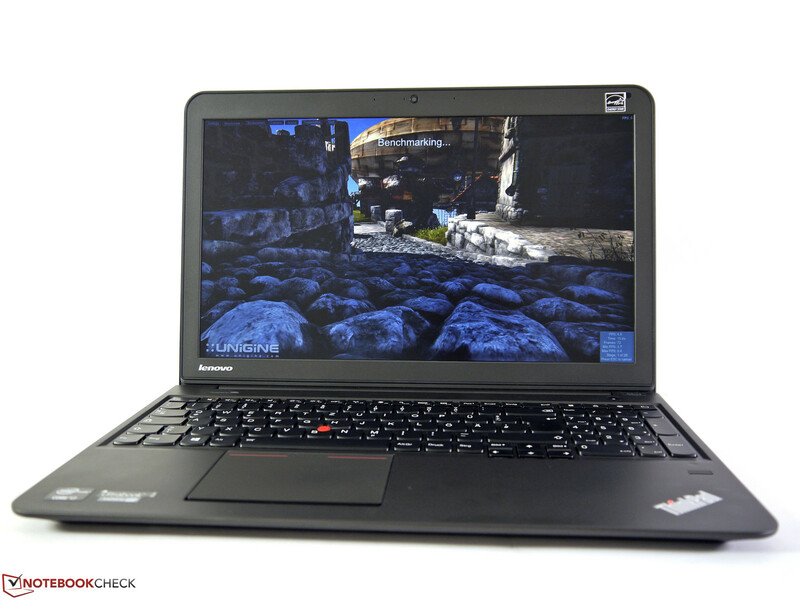 You can also find more results in the review of the ThinkPad S440, which is also equipped with the AMD Radeon HD 8670M. 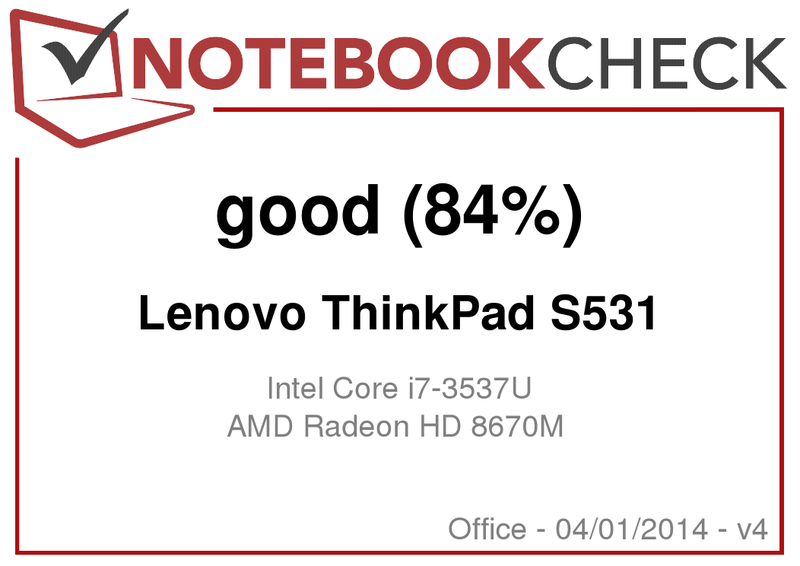 Similar to the ThinkPad S440, Lenovo does a very good job in regard to the noise development of the ThinkPad S531. The fan is very quiet or even deactivated in many scenarios and it spins up very slowly with light workloads, which was also apparent in our 3D Mark 06 benchmark. The maximum value of 33.6 dB(A) was reached after half of the benchmark was finished. 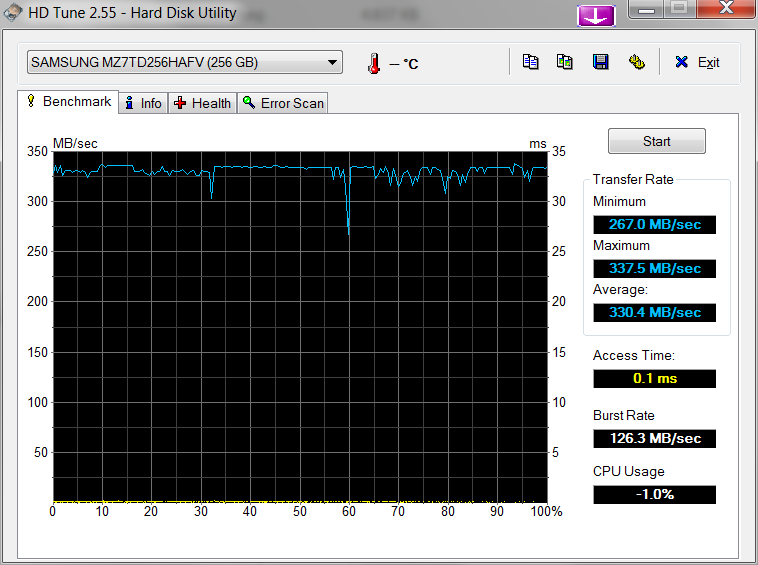 Finally, we measured 35.8 dB(A) under load, which is still very bearable even for longer sessions. 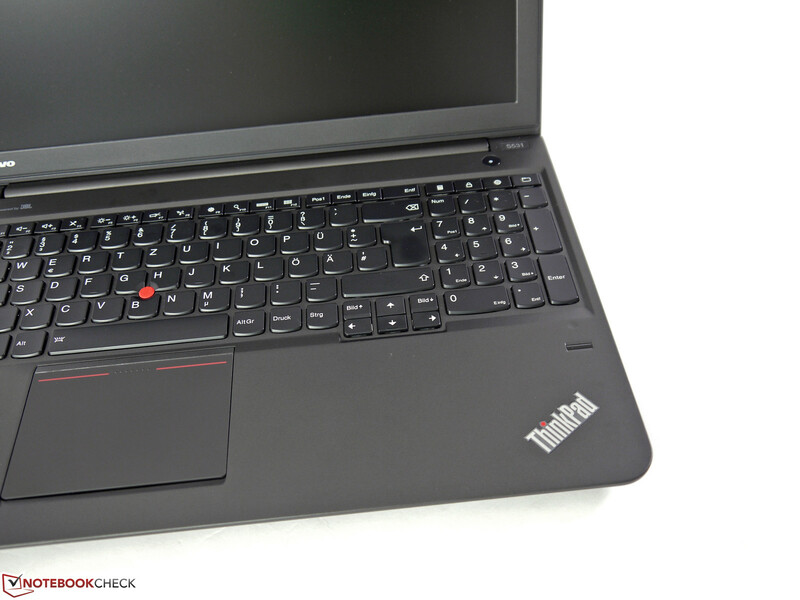 The maximum temperatures of around 60 °C (140 °F) under load are lower compared to the ThinkPad S440, but they are still very high and you should really use the notebook on your desk instead of your lap. 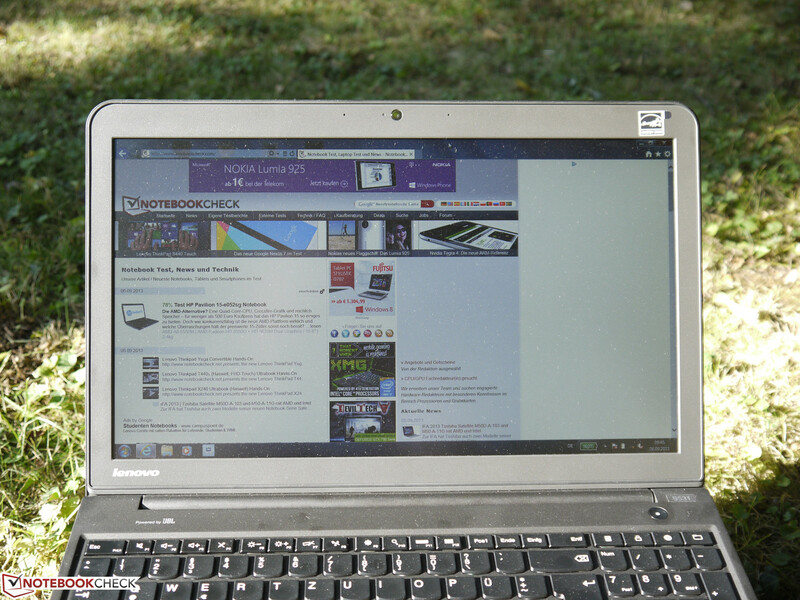 Otherwise, you can comfortably work with the ThinkPad S531 since the surface temperatures at the palm rest are comparatively low with a maximum of 37 °C (98.6 °F). The situation is significantly better with light workloads, where the case is much cooler. A maximum temperature of 34.2 °C (93.56 °F) at the fan exhaust in no problem at all. (-) The average temperature for the upper side under maximal load is 42 °C / 108 F, compared to the average of 29.4 °C / 85 F for the devices in the class Office. (-) The maximum temperature on the upper side is 59.9 °C / 140 F, compared to the average of 33.9 °C / 93 F, ranging from 21.2 to 62.5 °C for the class Office. (+) In idle usage, the average temperature for the upper side is 30.6 °C / 87 F, compared to the device average of 29.4 °C / 85 F.
(±) The palmrests and touchpad can get very hot to the touch with a maximum of 36.7 °C / 98.1 F.
(-) The average temperature of the palmrest area of similar devices was 28.2 °C / 82.8 F (-8.5 °C / -15.3 F). As expected for a business device, the sound experience is not suited for multimedia playback. It is very focused on high tones with almost no medium tones and bass. You can attach external solutions via USB, HDMI or 3.5 mm stereo jack. The 3.5 mm stereo jack follows the trend and combines the headphone port and the microphone port. 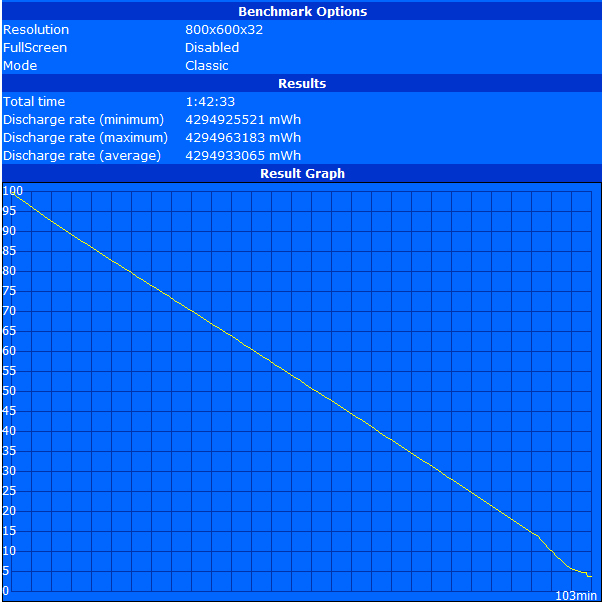 We measured power consumption between a minimum value of 6.7 Watts and a maximum of 53 Watts. The difference between the minimum and maximum display brightness alone is 4.5 Watts and will be an important factor in many runtime scenarios. The integrated battery has a capacity of 63 Wh. It is not glued inside the case and can easily be replaced if necessary. The power supply unit has a rated output of 65 Watts and should have no problems with the maximum consumption of 53 Watts. 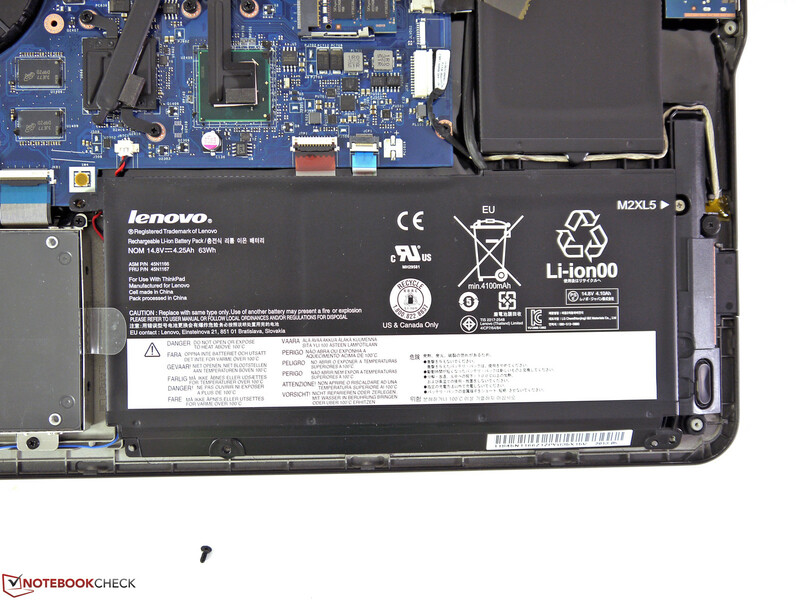 The battery runtimes of the ThinkPad S531 benefit from the frugal components and the comparatively large battery for a thin ultrabook. We determined a maximum runtime of an excellent 10:54 hours in the Battery Eater Reader’s Test (minimum display brightness of 8 cd/m², energy-saving mode, wireless modules deactivated, Intel HD Graphics). The more realistic WLAN Test (display brightness adjusted at 139 cd/m², energy-saving mode, wireless modules activated, Intel HD Graphics) runs for 5:25 hours, still a good result. The battery is empty after 1:43 hours in the Battery Eater Classic Test (maximum display brightness, High-Performance profile, everything activated, AMD graphics). 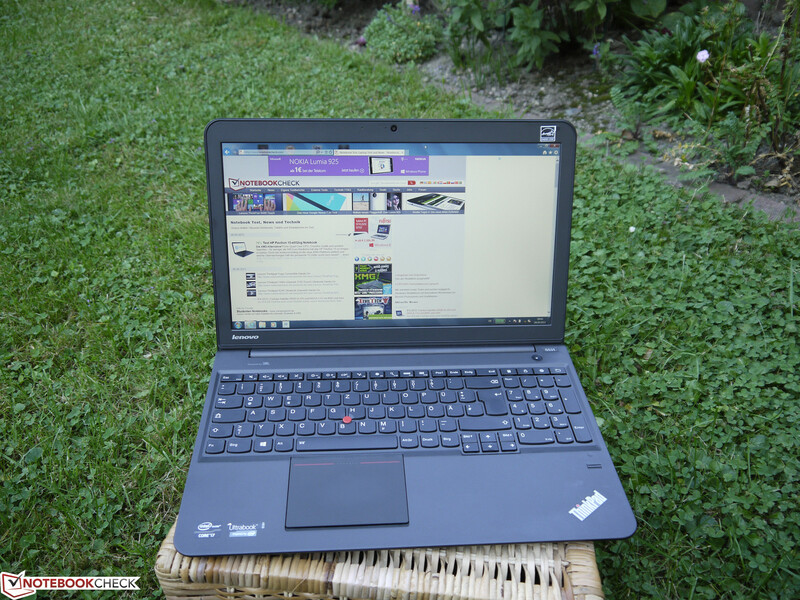 Lenovo’s ThinkPad S531 is a very good ultrabook with many positive aspects. The mobility is very good for a 15-inch notebook thanks to the comparatively low weight and the decent battery runtimes. However, this does not mean that you have to sacrifice performance; the system is actually more than sufficient for many tasks. The only drawback in this section is the dedicated AMD GPU. It cannot really convince us in terms of performance since it is slower than the integrated Intel GPU in many scenarios. The system noise is very quiet and it only attracts attention under maximum load, where we can also measure very high surface temperatures that can affect the handling. While there is no reason to criticize the keyboard or the case, the display cannot really convince us. It has a low contrast ratio, limited viewing angles (especially vertically) and does not reach the advertised brightness. Our review unit is currently available for around 1,100 Euros (~$1468). 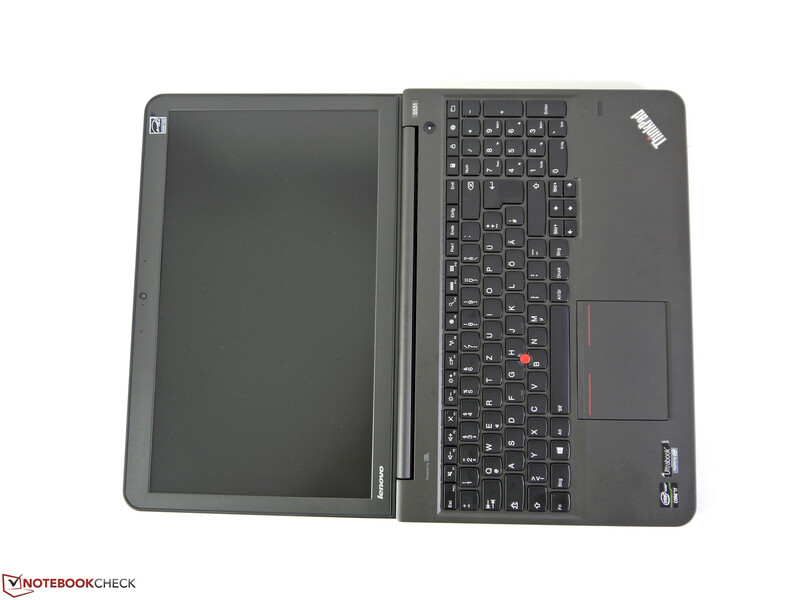 Although it is an attractive overall package, the ThinkPad S531 is in a tough spot since the successor ThinkPad S540 will be available soon. ...and combines the best aspects of both worlds. ...and were even improved in some cases. The display has a big opening angle. 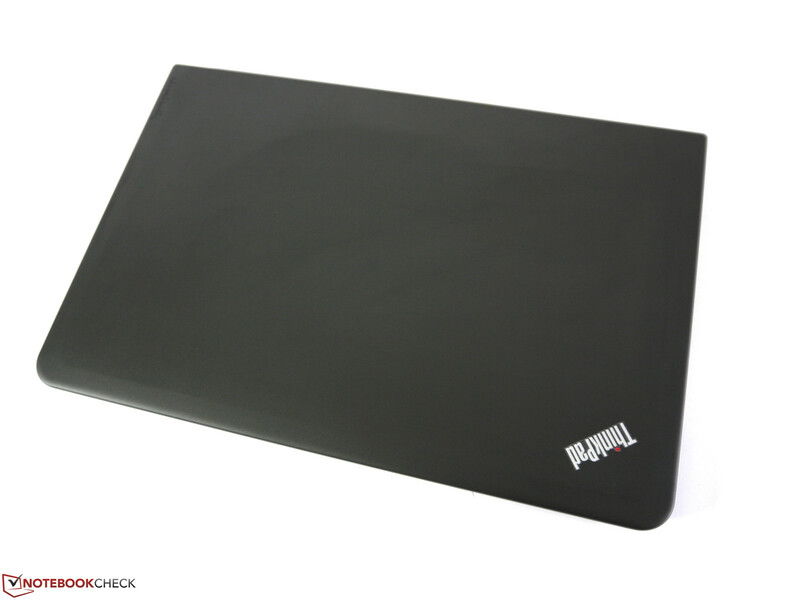 You can clearly recognize it as a ThinkPad. The display has a low contrast ratio and bad viewing angles but is still suited for outdoor use. The new touchpad comes with integrated mouse buttons and takes some time getting used to. A fingerprint reader and other security features are available. The hinges keep the display well in position. 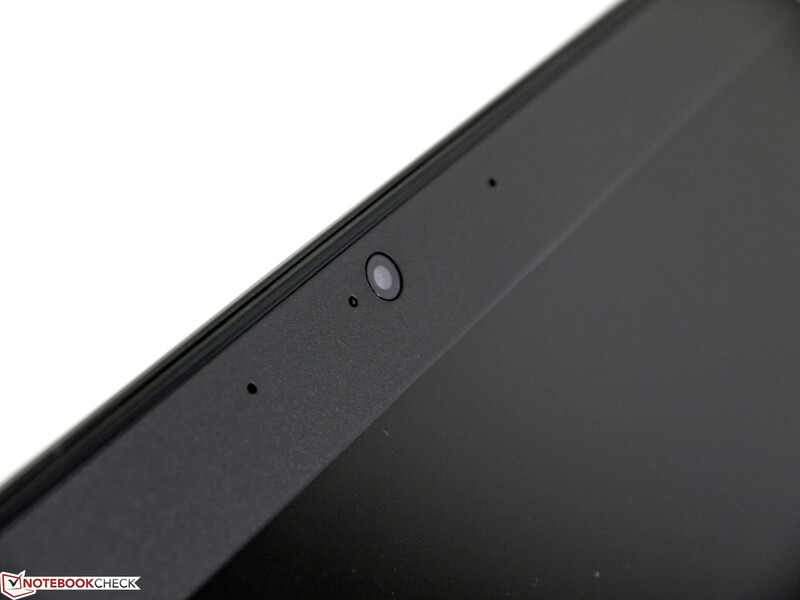 The webcam with 720p resolution is supported by two Dual-Array microphones. The ports are far at the rear area of the sides. 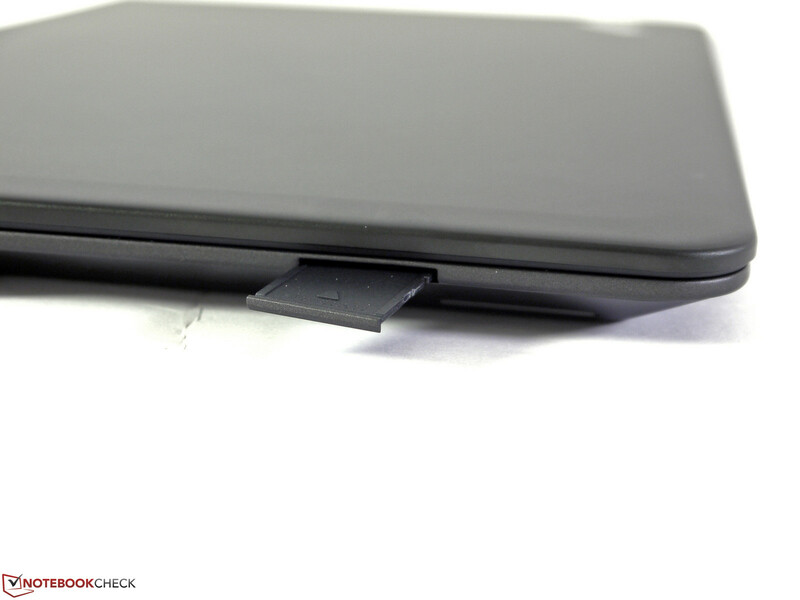 Easy to reach: SD card slot further at the front. Lenovo's OneLink is a good alternative to traditional docking solutions. The ports are almost too close together. Power supply unit with 65 Watts. 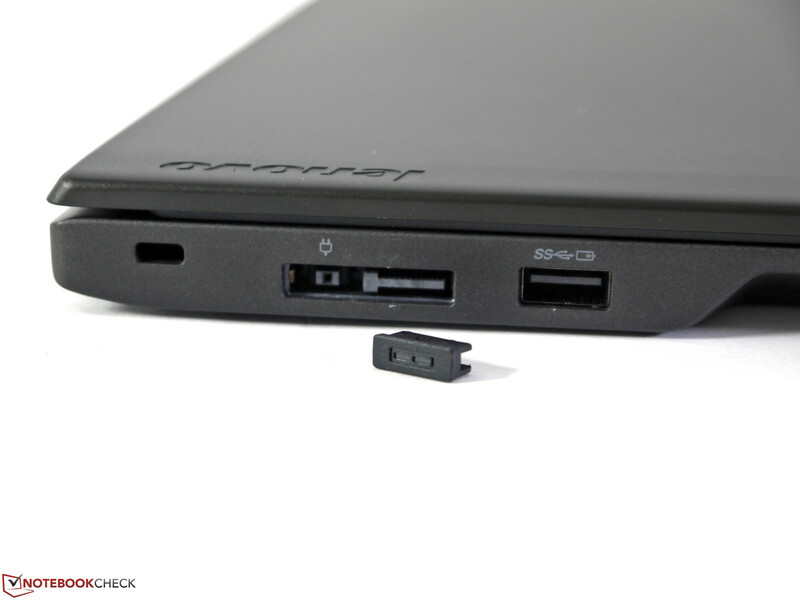 The new power connector can also be found at the new T-series ThinkPads. 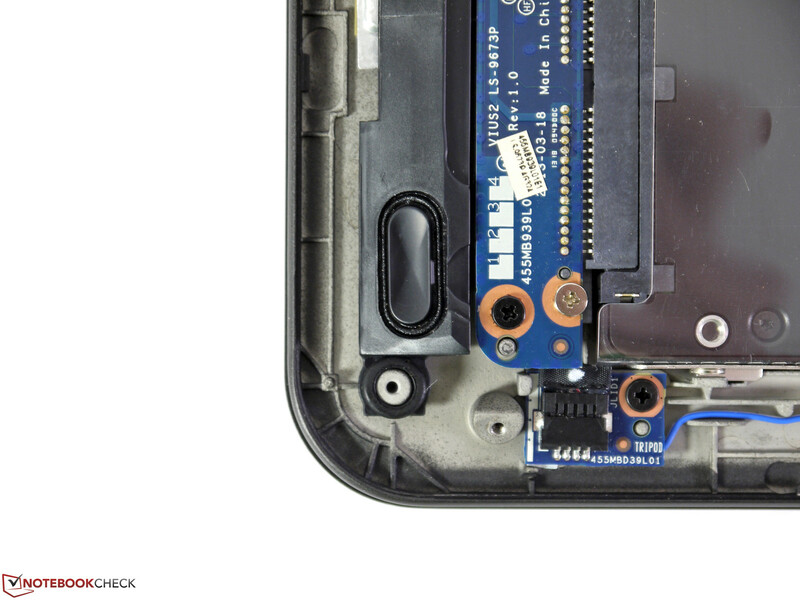 The bottom cover is fixed with screws but can easily be removed. After that you gain access to all important components. It has a generous capacity of 63 Wh. The performance of the two speakers is average. 2.5-inch Solid State Drive with a height of 7 mm. Light and thin but sufficient performance with an excellent noise development. 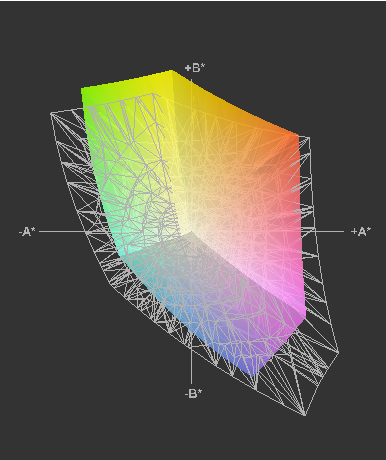 A display with wider viewing angles and a higher contrast ratio. 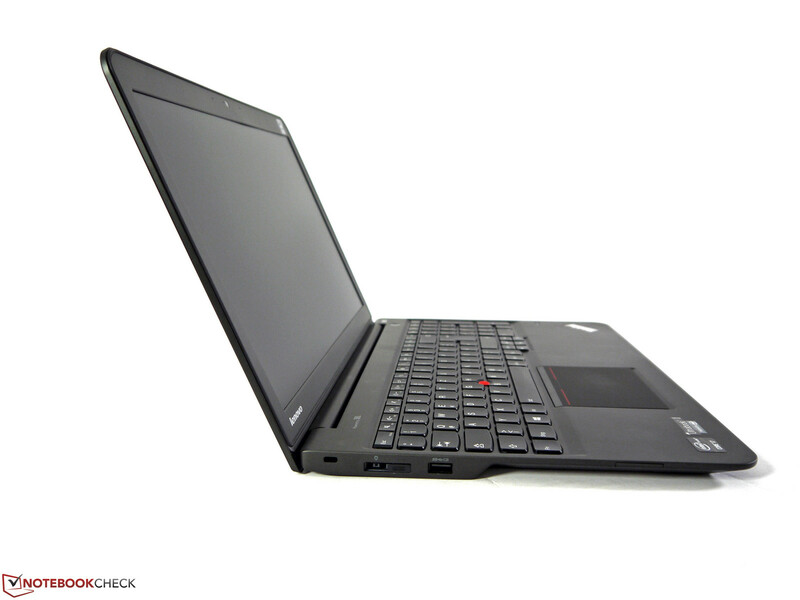 That the ThinkPad S531 is available for a few weeks and the successor is already on its way.